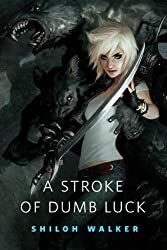 A Stroke of Dumb Luck is the first prequel to the Colbana Files series by JC Daniels. Yes, Shiloh Walker and JC Daniels are the same author. This story is how Kit met Jude when she took out the wererat pack that stole her friend Collen’s daughter. The story is referred to in Bladed Magic. Kit goes in after the girl and ends up letting Jude help get her out. This one is pretty short, and can be read for free from author JC Daniels’ website.